Some youth pastors neglect their own leadership development. It is very common for youth pastors to lack leadership skills because they don’t value or grow in their leadership skills. They believe leadership development is just for the old ministry guys. Why do some youth pastors not like learning about leadership? — Only rely on their God given talents and personality to lead their youth ministry which will, ultimately, backfire or break down at some point. — Are too cocky to admit they need help because they view this as being a weak, insecure and inexperienced youth pastor. — Have lazy and clumsy leadership habits which causes them to hurt a lot of people they work with and minister to and potentially kill the momentum of their youth ministry. — Don’t know how to lead and manage people which causes their youth ministry to plateau. Leadership is about influencing and motivating others to be apart of a mission. Leadership is a skill that requires practice, errors, lessons learned, reflection and so on and so on that the skills continue to be refined and polished. Leaders are required to learn about leadership so they can lead others well, make an incredible impact and be a leader who lasts. Leadership development really does make a difference. Developing yourself is not a selfish pursuit. Botton line: You are not born with great leadership skills, which is why developing yourself is incredibly important. 7. Choose to start growing now. Making a conscious decision to better yourself allows you to start growing. Growth doesn’t happen automatically. Today, it is your responsibility as a youth leader to grow, which will make you a better leader tomorrow. 6. Have a teachable spirit. This is a hard one for most youth pastors. Why would I value someone else to tell me how to lead my youth ministry? Being open is key. Three questions: What new ideas have you ignored? What new ideas can you pursue? What old ideas can you replace for the new ideas? 5. Always be learning: Haven’t you heard — leaders are readers? Well it is true. Great leaders focus on acquiring knowledge. Gaining information is vital to a leader because an understanding of the factors involved is necessary to create a vision for the future. =If you stop learning, your leadership will become very stale. Read books, blogs, magazines, go to conferences, listen to interviews, study other ministries, etc. Make learning a priority in your crazy ministry schedule. 4. Develop a system to apply your learnings. Filing and applying. You have to develop a filing system to store all of your amazing learnings. I found that utilizing online storage (i.e dropbox and evernote) to file my learnings works perfectly. I can access it anytime and anywhere. Once filed you need to apply quickly so you can remember what you just learned. You can ask yourself: Who can I tell what I just learned? Where can I apply it? 3. Be ready to pay the price. Nothing is ever free. There is a price tag for personal and leadership growth. Here are a few price tags: (a) discipline (b) challenges (c) loneliness (d) time (e) relationships/friendships. 2. Never stay satisfied with present and past success. Being satisfied = no areas for improvement. If you are too busy celebrating about your glory days, you will never grow. What will you do that will pull you forward? 1. Study and watch great leadership in action. Leadership is taught and caught. So find great leaders you respect and observe their every move. Read biographies of great leaders. When studying and watching, pay close attention to how leaders deal with numerous intangibles, challenges and use their intuition. Observe how experiences and challenges a leader faced will provide credibility. Identify how they have courage, become component and develop their character. 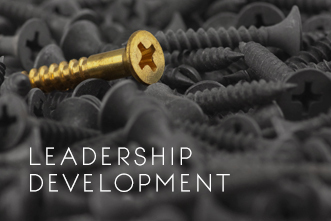 For me, leadership development was something I enjoyed very early on in my ministry career. So this comes easy to me, but I realize that it is very difficult for others. I came to realize that true leadership comes from character and discipline. A good track record speaks volumes to followers which is why developing and maintaining relationship is so huge. I wrote about the top 20 leadership lessons I learned from an incredible senior pastor, Wally Norning. All I am saying is that leadership development will not only keep you in the game, but it will keep you on top of your game. Learn to love learning about leadership.